In 1987, Durell Software released a game called Saboteur II: Avenging Angel. Don't worry if you haven't played the original Saboteur, because no prior knowledge will be required for this post. What will be required is an appreciation for awesome game settings and even awesomer box art. Both Saboteur games were designed by Clive Townsend, and revolved around ninjas breaking into places and stealing or stopping stuff, all the while trying to avoid being killed. Anyway, by the time the second Saboteur came around, the hero of the first game was dead. 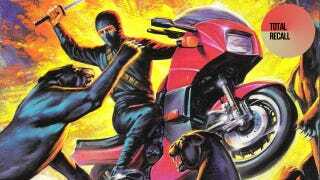 So you play his sister, who is also a ninja, and have to...do some more breaking in, something to do with a nuclear missile, whatever, it's a game from 1987, the story doesn't really matter. What matters is that Saboteur II had a female protagonist. For a serious game released in 1987, that was kind of a big deal, especially since she wasn't a princess or cartoon character. She was a ninja. She wasn't just any ninja, either. In keeping with the fact this was a computer game from the 1980s, she was an explosively badass one, who rode a big motorbike, dropped off hang-gliders to enter missions and had to fight pumas. Much of which features on the game's PC box art (below left), which differs from the Spectrum and C64 art (below right), which instead focused on nuclear missiles and hang-gliders. Both rank among some of the best pieces of video game cover art of all time. I had Saboteur II on the Commodore 64, and remember enjoying the hell out of it while I was a kid. Each mission in the game had you doing something different; sometimes you'd be sneaking in and stealing something, other times you'd be assassinating somebody and sometimes stealth would give way to straight-up fisticuffs. Sadly the series ended with the second game; despite plans for a third, no sequel was ever completed. Which is probably for the best. Put anything more awesome in a game and it might not be able to handle it. If you want to give the game a try, it's widely available as abandonware.